Many people have enjoyed using the Zellies Toothbrush, but unfortunately this is currently not available. We searched for a replacement and found the MouthWatchers Antibacterial Toothbrush! This brush is very comfortable and has an added advantage of being antibacterial. 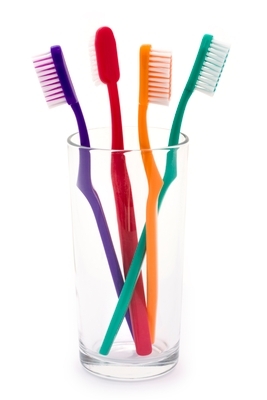 Toothbrushes easily get infected and mold grows on a regular brush if it is stored wet. Toilet bacteria travel through the air and sometimes contribute to bleeding gums, periodontal pocketing and bad breath. Always spritz or swish a toothbrush in Listerine after brushing, or use an antibacterial brush. The Mouth Watchers brush has silver in the bristles to stop the growth of bacteria and molds. Even so, we recommend you clean it once a week (to thoroughly sanitize it). Whether you use a regular or antibacterial brush like the Mouth Watchers Anibacterial Toothbrush, the recommendation is to discard your brush each month or any time you are ill. Be vigilant if you stay in hotels or travel with your toothbrush stored in a bag or under a cover. Visit Zellies.com to order your Mouth Watchers Antibacterial Toothbrush today! Quirynen, M., De Soete, M., Pauwels, M., Gizani, S., Van Meerbeek, B., van Steenberghe, D. 2003. Can toothpaste or a toothbrush with antibacterial tufts prevent toothbrush contamination? J. Periodontal. 74: 312-322. Verran, J., Leahy-Gilmartin, A.A. 1996. Investigations into the microbial contamination of toothbrushes. Microbios. 85: 23 1-238. Warren, D.P., Goldschmidt, M.C., Thompson, M.B., Adler-Storthz, K., Keene, H.J. 2001. The effects of toothpastes on the residual microbial contamination of toothbrushes. J. Am. Dent. Assoc. 132: 1241-1245. Previous Post Looking for a Dentist? Next Post Say Goodbye to Bad Breath!